The American statesman Benjamin Franklin (1706–1790) once wrote: “No nation was ever ruined by trade.” Many economists would express their attitudes toward international trade in an even more positive manner. The evidence that international trade confers overall benefits on economies is very strong. Trade has accompanied economic growth in Canada and around the world. Many economies that have shown the most rapid growth in the last few decades—for example, Japan, South Korea, China, and India—have done so by dramatically orienting their economies toward international trade. To understand the benefits of trade, or why we trade in the first place, we need to understand the concepts of comparative and absolute advantage. Jamie: 50 pineapples and 10 crabs. Between the two of you, you are producing 70 pineapples and 28 crabs. Is this efficient? Recall that a situation is efficient if there are no available Pareto Improvements. If we can get more pineapples and crabs without having to give anything up, then the situation is inefficient. Each of you walks away with two more crabs than before. This is what we mean when we talk about gains from trade. Both you and Jamie are now able to produce at a point outside your PPF’s. To understand where these extra crabs come from, we must first explore the concept of comparative advantage. A country has an absolute advantage in producing if it uses fewer resources to produce. Absolute advantage can be the result of a country’s natural endowment. For example, extracting oil in Saudi Arabia and other Middle Eastern countries is essentially just a matter of drilling a hole. 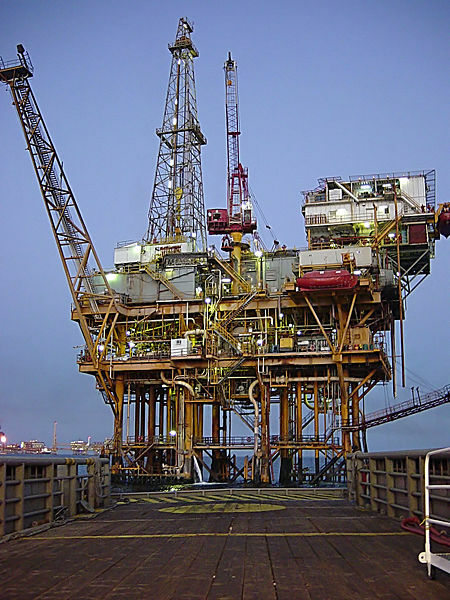 Producing oil in countries like the United States can require considerable exploration and costly technologies for drilling and extraction. This case of absolute advantage has been a key contributing factor towards much of the chaos in the Middle East. The United States and other countries will go to great extents to defend their oil interests, and will sometimes meddle in other country’s affairs in devastating ways. Let’s look further into these gains from trade. When you increase your production of pineapples from 20 to 30, you have to give up 4 crabs. This means your marginal cost is 0.4 crabs for 1 pineapple. When Jamie decreased his production of pineapples from 50 to 40, he gained 8 crabs. This means his marginal cost was 0.8 crabs for 1 pineapple. The gains from trade arise from this difference in marginal cost. 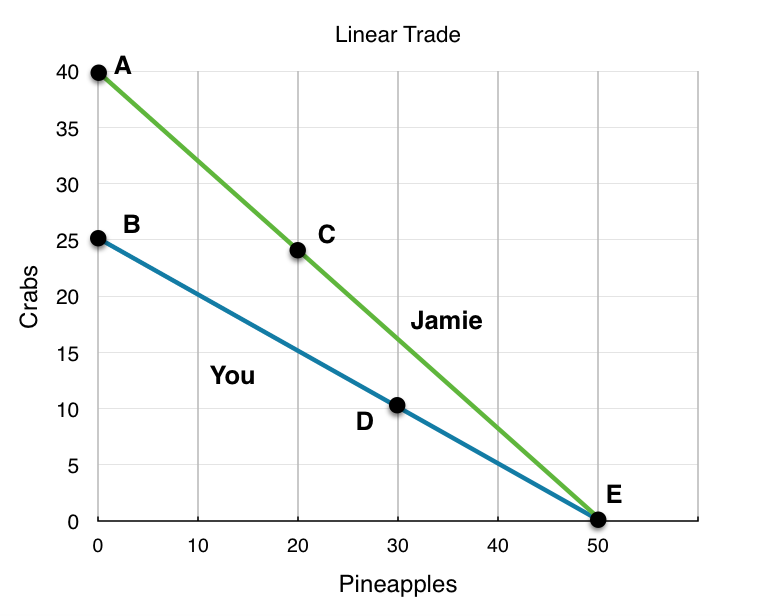 Since it is more expensive for Jamie to produce pineapples (MC of 0.8 versus your MC of 0.4) he should produce fewer pineapples and more crabs. The economic agent with the lower marginal cost of producing a good has the comparative advantage in producing that good. In this case, you have the comparative advantage in producing pineapples, and Jamie has the comparative advantage in producing crabs. This specialization in production results in gains from trade, as each person or country can focus on what it can produce at the lowest cost. Note that even though Jamie had the absolute advantage in both goods, his marginal cost of producing crabs was still higher, since marginal cost is based on a trade-off between the two goods. We can liken this example to a trade between Canada and a developing country. Canada may be better at producing both computers and textiles (the absolute advantage) but the advantages we have in producing computers are far greater. Any hour we have to give up to produce textiles comes at a much higher cost to us than it would to a developing country, giving us the comparative advantage at producing computers, and the developing country the advantage at producing textiles. The island example is no different. Even though Jamie is better at producing pineapples, what Jamie is really an expert at is producing crabs, so having to give up time spent catching crabs comes at a high cost. In this example, marginal costs are changing. This means that depending on where individuals produce, they may have a different comparative advantage. 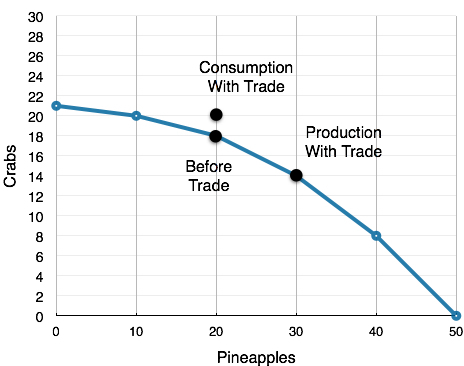 Recall that marginal cost is the slope of the PPF, so as each individual produces more pineapples, the pineapples become more expensive to produce. This is known as the law of diminishing returns which states that as additional increments of resources are added to producing a good or service, the marginal benefit from those additional increments will decline. This example has introduced a lot of different concepts – moving forward, our examples will be simpler, and linear. 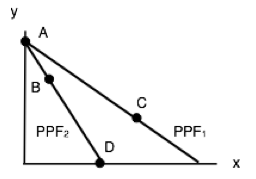 Most of the examples will deal with linear PPF’s. This makes problems considerably easier, since in the case of a linear PPF (in which the marginal cost will be constant), one individual will always have the comparative advantage in one good. This means that comparative advantage is the same at any point on the PPF, and can be easily calculated. We have changed Jamie and your skill set to be linear in Figure 2.3d. Now we can use our tools of efficiency and trade to determine if certain points are efficient. In Figure 2.3d various points have been shown to reflect possible points of production for you (blue) and Jamie (green). Remember, we have no information about preferences. The first step is to find who has the comparative advantage for which good. 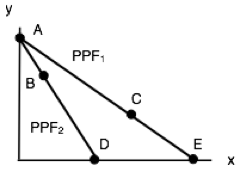 For a linear PPF, this just means finding the slope. 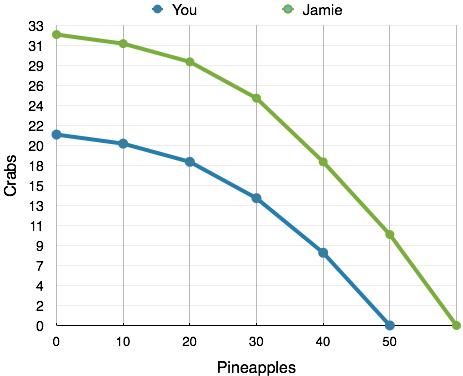 Jamie’s PPF has the slope of 40/50 or 0.8 Crabs for 1 Pineapple. 0.8 Crabs for 1 Pineapple. Your PPF has the slope of 25/50 or 0.5 Crabs for 1 Pineapple. 0.5 Crabs for 1 Pineapple. You have the comparative advantage in producing Pineapples. Remember that the 0.8 and 0.5 crabs represent the cost of pineapples in terms of crabs. It is similar to saying “It costs Jamie $0.80 to buy a Pineapple, it costs you $0.50, who should buy it?” In a PPF, cost is denoted in terms of the other good, not dollars. Jamie has the comparative advantage in producing Crabs. This is true for every point on our PPF. Now we will examine each of the points using this information. In this combination, Jamie produces only Pineapples and you produce only Crabs. This situation is clearly inefficient since each player is producing a good the other can produce for less. By changing production and trading goods, both parties stand to benefit. Recognizing that the last combination was inefficient, Jamie begins producing more Crabs and you begin producing more Pineapples. Although this seems to adhere to the comparative advantage, each of you are still producing goods that the other can produce for less. Jamie is still producing 20 Pineapples, and you are still producing 10 Crabs. As we saw before, if you both specialize in what you are comparably good at, then there will be even more gains from trade. This means that the situation is inefficient. Realizing the previous points were inefficient, Jamie produces only Pineapples and you produce only Crabs. In this situation both players are producing only the good they have the comparative advantage in. This situation is certainly efficient, as there are no production changes that can be made that result in more than 40 Crabs, and 50 Pineapples. What if we want 50 Crabs? Is there no way to produce this efficiently? There is. Point A/Point E is not the only efficient point possible. This is because of preferences. If in total, you and Jamie prefer only 40 Crabs, then Point A/ Point E would be the efficient point where you would produce, but if you and Jamie desire 50 Crabs, that would not be the preferred combination. If you desire 50 Crabs, then the person who has the comparative advantage in Crabs (in this case Jamie) should produce all 50 Crabs, or produce as many Crabs as possible. In this case, Jamie can only produce 40, which leaves the remaining 10 to be produced by you. Although Jamie could produce these 10 Crabs more efficiently, he is constrained by his production ability. This means that Point A/Point D is also an efficient combination of goods, since there is no way to acquire 50 Crabs which results in more than 30 Pineapples being produced. It should logically follow that this combination is also efficient. Even though you have the comparative advantage at producing Pineapples, if the Pineapples are poisonous and no one wants any, both you and Jamie will produce only Crabs! There is no other way to produce 65 Crabs where you will have any Pineapples left. This simple rule occurs since any combination where both players produce a mix of goods is a combination where players stand to gain from more specialization and trade. These gains only end when at least one player has exhausted the gains from specialization, and is producing only the good they are comparatively better at. 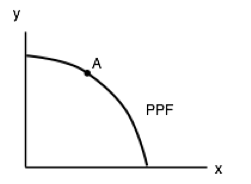 In summary, the PPF is a model we can use to represent the production of one or more parties. Trade allows parties to consume at points outside their PPF when they maximize comparative advantage. The party with the lower opportunity cost will have the comparative advantage in the production of a good. 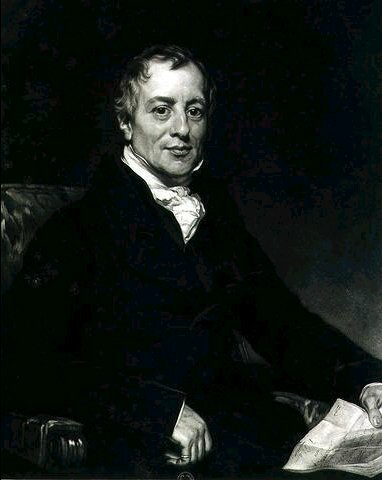 Even though a party might have the absolute advantage in the production of both goods, since comparative advantage is based on opportunity costs, other parties can still retain comparative advantage. Parties can achieve gains from trade by specializing in the good they are comparably good at, to the extent that consumers want that good. In Topic 2, we have explored the production possibility model in depth, looking at a simplified version of trade and deepening our understanding of opportunity costs. Now, we can take our knowledge of basic economic modelling and our comprehension of costs and examine one of the most important of microeconomics: supply and demand. 1. The following question refers to the table below, which shows the maximum number of goods X and Y that producers A and B can produce in one day. Which of the following statements in TRUE? a) Producer A has the comparative advantage in producing X.
b) Producer A has the comparative advantage in producing Y.
c) Producer B has the absolute advantage in producing X and Y.
d) No producer has the comparative advantage in producing either X or Y. 2. 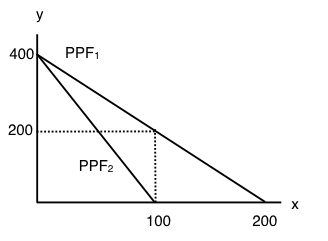 Consider the PPF diagram drawn below, for two countries that are free to trade with one another. Which of the following production combinations is/are INEFFICIENT? I. Country 1 produces at point C and country 2 produces at point D.
II. Country 1 produces at point E and country 2 produces point at B.
III. Country 1 produces at point E and country 2 produces at point A.
c) I and II only. 3. The diagram below illustrates the PPFs for two countries that produce wine and cheese. With no trade, country 1 produces at point A on its PPF and country 2 produces at point B. Assume that the two countries now begin to trade with one another. Which of the following will NOT occur (relative to the case with no trade). a) Country 1 will produce less cheese. b) Country 2 will export wine. c) Country 1 will import cheese. d) Country 2 will produce more cheese. 4. Which of the following statements about production and trade is FALSE? I. If a country has an absolute advantage in producing a good, then it also has the comparative advantage in the production of that good. II. Rich countries will generally have the comparative advantage in the production of all goods. III. If a country has the absolute advantage in the production of a good, then this country will be made better off by specializing in the production of that good.a) I only. c) I, II and III. The following THREE questions refer to the diagram below, which illustrates the PPFs for two countries who are free to trade. 5. What is the marginal opportunity cost (MC) of producing good x in each country? a) 2 units of good y in country 1 and 4 units of good y in country 2.
b) 1/2 a unit of good y in country 1 and 1/4 of a unit of good y in country 2.
c) 2 units of good y in country 1 and 1/4 of a unit of good y in country 2.
d) 1/2 a unit of good y in country 1 and 4 units of good y in country 2. 6. What is the marginal opportunity cost (MC) of producing good y in each country? a) 2 units of good x in country 1 and 4 units of good x in country 2.
b) 1/2 a unit of good x in country 1 and 1/4 of a unit of good x in country 2.
c) 2 units of good x in country 1 and 1/4 of a unit of good x in country 2.
d) 1/2 a unit of good x in country 1 and 4 units of good x in country 2.
a) 200 units of y.
b) 400 units of y.
c) 600 units of y.
d) 800 units of y. 8. The diagram below illustrates the identical PPFs of two countries. Initially, there is no trade allowed between the two countries, and each country produces at point A. If trade is opened up, which of the following will occur? I. Country 1 will export coal to country 2. II. Country 2 will produce more clothing. III. Country 1 will produce less coal. a) I and II only. 9. The table below shows the maximum amounts of coffee and salmon that Brazil and British Colombia can produce if they just produce one good. b) In Brazil, the marginal cost of salmon production is 2 units of coffee. c) In BC, the marginal cost of coffee production is 1½ units of salmon. 10. The diagram below illustrates the PPFs for two countries that produce two goods. The two countries are free to trade with one another. Which of the following production combinations are efficient? a) Country 1 is at point C; country 2 is at point D.
b) Country 1 is at point A; country 2 is at point B.
c) Country 1 is at point C; country 2 is at point A.
d) All of the above are efficient. 2.3 Trade by University of Victoria is licensed under a Creative Commons Attribution 4.0 International License, except where otherwise noted.